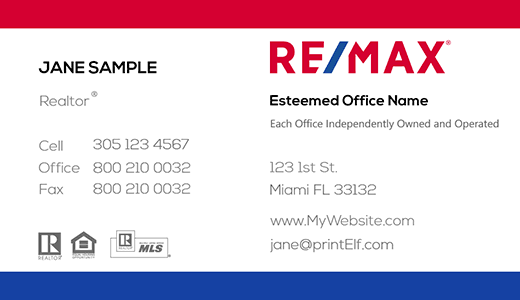 MIAMI - March 20, 2018 - PRLog -- Realtors long grasped the importance of business cards. Loathed or loved there simply is no proper replacement for the humble printed card. So why not make the best of it? That is, if you want to look fresh and up to date as a real estate agent. 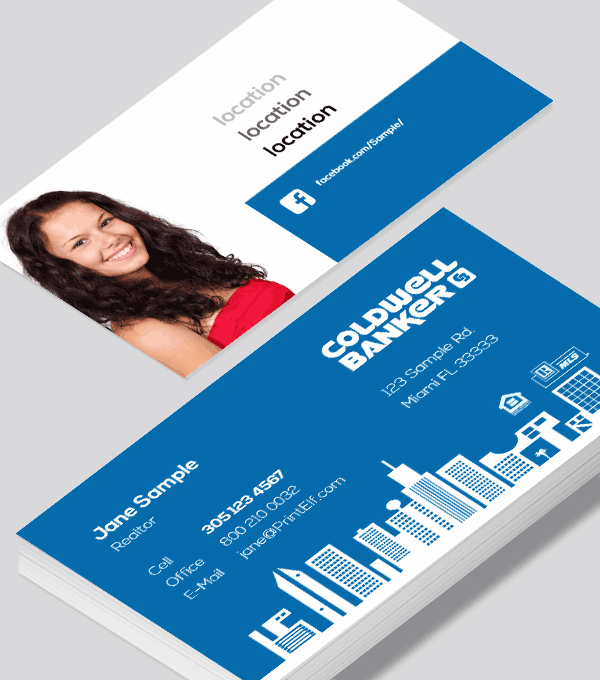 Entering PrintElf, the hip high tech online printing service with an online business card designer like no other. Select a free design to edit and it snaps into view. It all happens in one second, allowing to quickly move among the many template designs available. Real estate agents find it easy to pick a design and modify on the spot. Yes, forget about having to battle traffic to visit a local printer, especially when free shipping is included. Changes you make to your design are in real time and allow to instantly see what the final print will look like. Upload a photo of yourself and place it as needed. You can resize and move it precisely because the canvas is huge, allowing for fine tuning. The same goes for your logo or any other images you would like to add. Whether you work for REMAX, Coldwell Banker, Keller Williams, Century 21, EWM or any other Real estate agency you don't want to look like the Smiths next door. It's in the software. They invested heavily in programming one of the print industry's fastest free online designer. Use the large canvas to truly see what you get. There is even a hold in your hands preview. Officially approved logos and designs. PrintElf follows design rules set by the various real estate companies. Unlike many of the online printing services they insist on human interaction. Every print job is checked for validity. If they see something off, they will write or give you a quick phone call. Let PrintElf do the print marketing while you concentrate on selling properties and homes. PrintElf prints on high end Heidelberg digital and offset presses. The result is a spectacular full color print. There are choices of UV (gloss), silk laminate and even plastic. What you see is what you get pricing. No annoying up-sale but all-inclusive pricing. Fast turnaround. All jobs are handled right away. Design services are available. Simply purchase one hour of labor or get an estimate first. You will be dealing with a person right here in the USA that understands your needs as a Realtor. 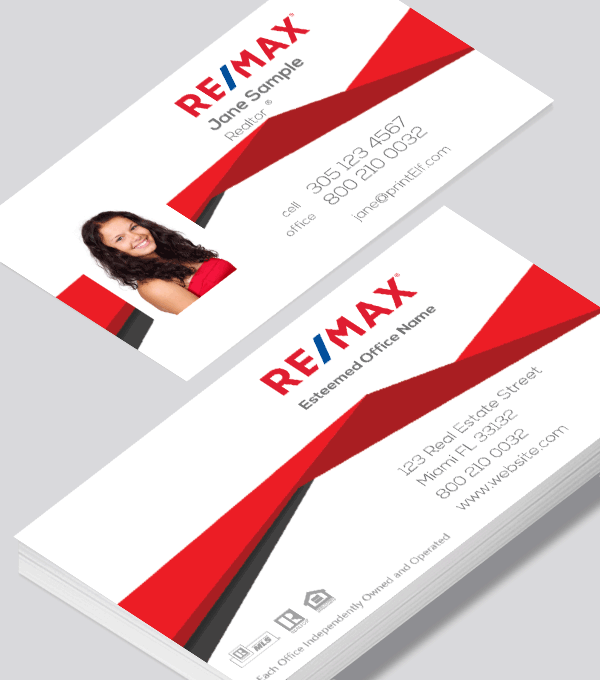 New real estate business designs are released on a weekly basis. 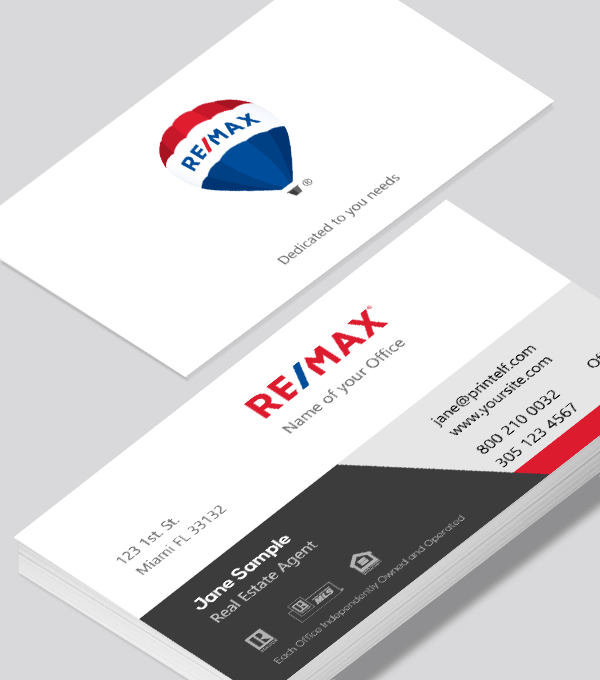 New sections such as the REMAX business cards allow you to quick peruse designs for your real estate company.